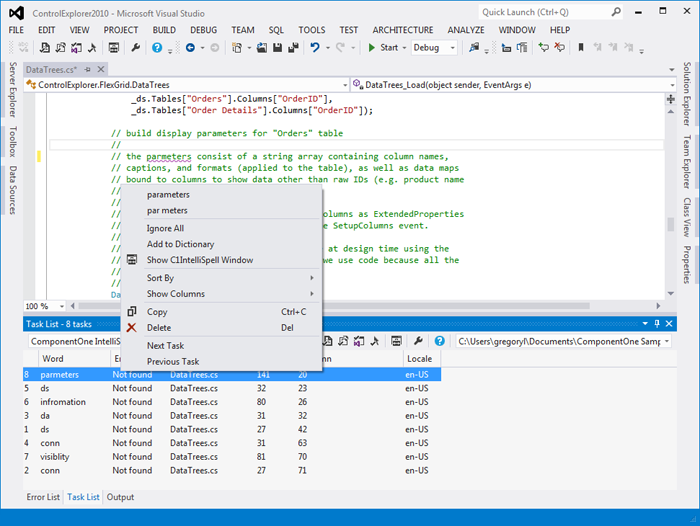 Spell-check code, comments, strings, HTML, XML, resources, and general text in Microsoft Visual Studio 2017 as well as Visual Studio versions 2012, 2010, and 2008 with ComponentOne IntelliSpell™. *IntelliSpell is only available with ComponentOne Studio Enterprise and Ultimate. The Options dialog box can now be used to specify the types of files that should be spell-checked. You can specify, for example, that files with extension "licx" should be checked as XML, and that files with extension "doc" should be checked as text. Spell-check multiple files, your projects, or your entire solution. IntelliSpell provides an easy-to-use, one-click operation. 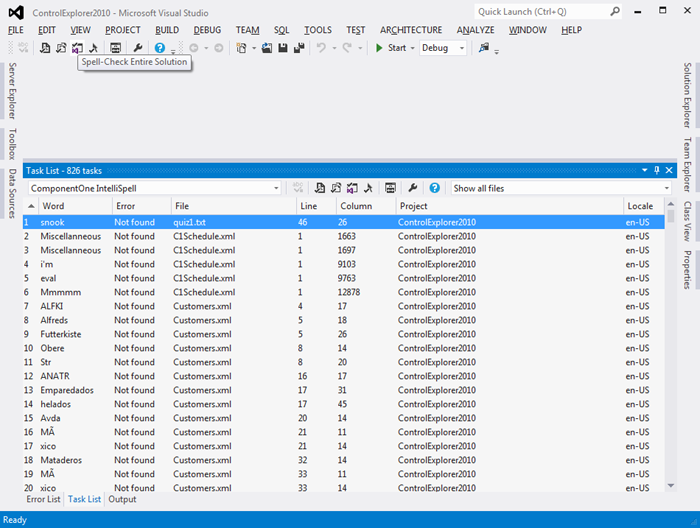 Spell-checking your Visual Studio application is even better with as-you-type spell-checking functionality. You can easily correct spelling errors in files (HTML, XML, resource, text) and code (comments, strings) as you type. You can customize any dictionary or create a text file to define custom words to ignore by the spell checker. IntelliSpell has its own spell-checking engine and does not rely on Microsoft Office spelling services. No longer do you have to have Microsoft Office installed or import/export documentation to solve this problem. 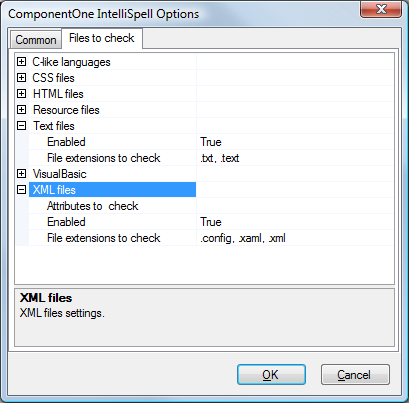 IntelliSpell eliminates the need to export XML-based help documentation to a word processing application for spell-checking. Decrease errors and take less time to complete spell-checking. All spell-checking data can easily be tracked within your application (wiggly underlines), or within the Task List (line item spelling mistakes). This makes it easy to run through corrections for an entire project. 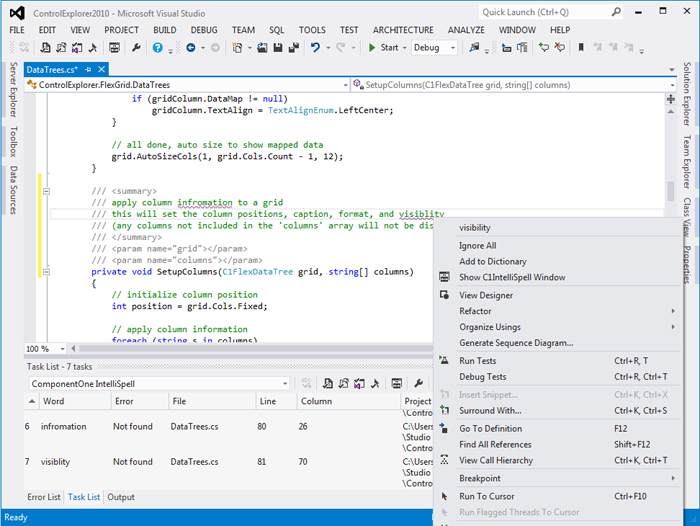 Simply double-click the spelling mistake in the Task List to open the Visual Studio file containing the spelling error; you do not have to search through pages of code to find spelling mistakes.